In the historic Old Firehall Building across from the Port Place Mall. We carry a large selection of art supplies such as; paint brushes, canvas, birch cradle boards, canvas boards, raw canvas, oil paint, acrylic paint, goauche, watercolours, varnishes, painting mediums, coloured pencils, chalk pastels, oil pastels, charcoal, screen printing supplies, sketchbooks, calligraphy supplies, inks, chalk paints, watercolor paper, printmaking paper, drawing paper, tracing paper, easels, modeling clay, textile paints and dyes. Please see our supplies section for full details. Spray adhesives, glues, tape, and all things that bond & seal. Easels from table top to h frame and everything in between. Chinese and India inks for art or writing. Products that are fun and suitable for children. Tombow, Copic, Ad Markers, Pigma, GellyRolls and so much more. Tools and clays for sculpting and modeling. A great selection of watercolour, oil and acrylic paints and mediums. Soft, Oil and water-soluble pastels and art sticks for drawing. Natural pigments can be used in any medium to make your own paints. Surfaces for Painting, Drawing, Printmaking, etc for making art on. A variety of textile dyes and markers and paints. Rulers, Xacto, palette knives tools for the trade. Varnishes for watercolour, acrylic and oils. 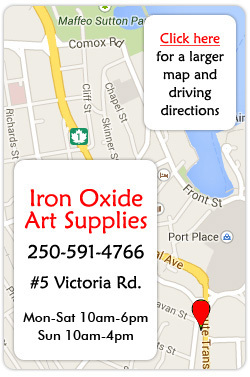 Iron Oxide Art Supplies first opened it's doors in January of 2014 in the historic #2 Firehall building in downtown Nanaimo but it's roots go back much further as the proprietor, Willow Friday, opened her first store, House of Indigo Boutique, back in 2002. Iron Oxide carries a full spectrum of art supplies including acrylic paints, oil paints, watercolor paints, spray paints, pastels, polymers, stencils, screenprinting supplies, inks, pencils and pens, markers and more! If we don't have it, please ask and we'll likely order it in.